What is Huron Community Bank's Debit Flex Overdraft Service? Debit Flex is Huron Community Bank's Overdraft Service for consumer checking accounts! It was designed to add an extra layer of coverage to provide our customers with peace of mind! How does Huron Community Bank's Debit Flex Overdraft Service work? If you overdraw your account by check, ACH electronic payment, bill pay, one-time debit card or ATM transaction - Debit Flex may cover your transaction even though you do not have enough money in your account. You will incur a $19.89 overdraft item charge; however, it saves you the embarrassment and potential fees from merchants. There is no monthly service charge to have Debit Flex on your account. The Overdraft Limit we offer to our customers ranges from $0 - $2,000 for personal checking accounts. The overdraft limit may vary depending upon your account status and financial history. Fees charged may reduce the Debit Flex amount available to you, so making a deposit within 24 hours helps you, and allows us to continue to provide Debit Flex Overdraft Service on your account. Customers, who have established overdraft protection through an automatic transfer from a savings account or approved line of credit, will have access to those funds first before using your Debit Flex Limit. 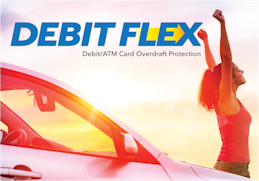 If you want the benefits of Debit Flex to apply to your everyday debit card and ATM transactions, you will need to 'Opt-In'. You can Opt-In over the phone (888-226-5422), in person at one of our convenient branch locations, or by printing the Debit Flex Opt-In form from our website and mailing it to us. You may Opt-Out at any time using the same methods stated above. Your decision to 'Opt-In' for debit card and ATM transactions does not guarantee we will always pay when there are insufficient funds in your account to cover the transaction. We retain the right to pay or not pay items at our discretion. Huron Community Bank's Debit Flex Overdraft Service is extended to all account holders with consumer checking accounts in good standing, defined as: 1) Making regular deposits sufficient to cover transactions; 2) Bringing the account to a positive balance when overdrawn with 24 hours, 3) There are no legal orders outstanding on your account; and, 4) There is no negative check reporting history with the consumer reporting agencies. We may, at our sole discretion, pay overdrafts up to the limits mentioned above including our normal overdraft item charge(s). The total fees you have paid for overdraft items (both paid and returned, for the current month and year-to-date) will be on your monthly statement. What does it cost to cover an overdraft? We encourage you to maintain accurate records and practice good account management. This will help you avoid transactions without sufficient funds and incurring the resulting fees. Huron Community Bank provides many different ways to help you avoid overdrawn incidents. We offer free Online Banking with e-Alerts so you can review your account balance every day in real-time, verify recurring payments, view transactions processed, transfer funds between your accounts, and receive updates when your balance drops below your pre-determined level. For more details about Huron Community Bank's Debit Flex Overdraft Service, please contact us at 888-226-5422 to speak to a customer service representative, or stop by one of our convenient branch locations. If you do not want the Debit Flex Overdraft Service on your checking account, then we will return each item presented for payment when you do not have sufficient funds in your account and charge you a $30.00 NSF fee. You may also be subject to additional fees from the business or merchant you initiated payment with in the event you do not have sufficient funds in your checking to cover the payment. If you do not want us to pay any overdraft items on your account, you must contact us at 888-226-5422 or visit a branch to Opt-Out of the Debit Flex Overdraft Service. For more details about Huron Community Bank's Debit Flex Overdraft Service, please visit our website (www.bankhcb.com), call 888-226-5422 to speak to a customer service representative, or stop by one of our convenient branch locations.